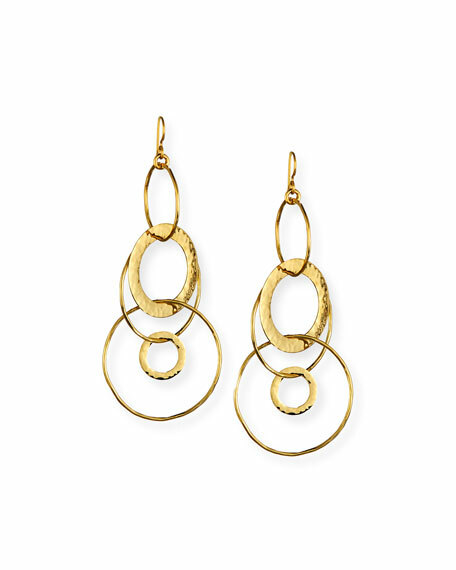 Ippolita "Jet Set" earrings from the 18K Classico Collection. Mixed interlocking hollow hoop drops. Devon Leigh hammered oval fan earrings. 24-karat yellow gold electroplated drops. Hammered 18-karat yellow gold plating. Sphere drop with round clear crystals. Open oval center with fan dangle. 14-karat gold-filled French wire. Made in USA of imported material. Ippolita earrings from the Polished Rock Candy Collection. Polished 18-karat yellow gold hoops and hardware. Round turquoise posts with multi-size circle links. Donut slice link in white mother-of-pearl. Post backs for pierced ears. Approx. 2.7"L; 1.3"W. Imported. Ippolita earrings from the 18K Rock Candy?? Collection feature stones suspended in an open design. 18-karat yellow gold with textured finish. Mixed-set stones in Flirt assortment, including clear quartz, clear quartz/mother-of-pearl doublet, and white moonstone. Wire backs for pierced ears. Approx. 2.1"L x 0.6"W. Imported.